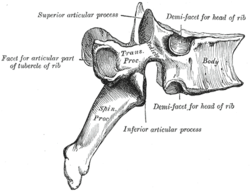 Position of the thoracic vertebrae (shown in red). In human, thoracic vertebrae consists of 12 bones. From top to down, T1, T2 ... T12.